Sharon Miner grew up in Connecticut, the middle child of eleven. An avid horse lover at an early age, she learned to ride and care for horses at Lee's Riding Stable in Wilton and later in Litchfield. She graduated from Norwalk High School, Norwalk CT, in 1972 as a junior so she could move with the stable. At 15, she purchased her first horse, a weanling colt named Charcoal. He died before he was a year old but that didn't deter Sharon from saving for her next horse, a pregnant mare she named Abby. She sold the foal, Bonita, and traded Abby for another pregnant mare, a Paint Horse named Dixie. The chestnut foal she named Fawn, and trained her by reading horse books. Fawn was the foundation horse for Unicorn Stables, a family-oriented riding barn Sharon and her husband, Bob, operated for 25 years. It was Fawn's life and sudden death at 15 that inspired Sharon to write. 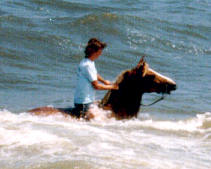 Sharon wanted to share Fawn's story because the mare was very near and dear to her heart. So she took writing courses from the Institute of Children's Literature, West Redding, CT and graduated in 1991. Sharon's first book, a young adult adventure story, The Delmarva Conspiracy, was published by Greene Bark Press, Bridgeport, CT in 1993. Sharon worked as a field correspondent for local newspapers in northeast Pennsylvania from 1997 - 2000. Since 1997, she has been a freelance writer for equine publications and online sites, and the editor for the Pennsylvania Equine Council's newsletter. 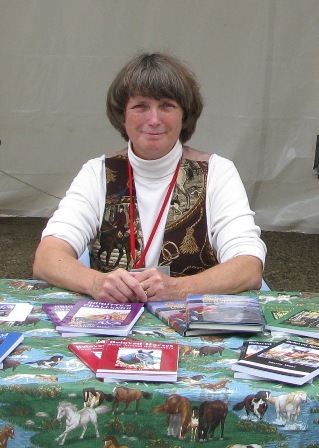 Currently, Sharon and her husband live in Tampa, Florida and travel throughout the United States with their Terrier cross, Scout, interviewing riders at equine events as well as marketing her books. Contact Sharon Miner at 814-937-0704 orsharonminer@yahoo.com.